For my younger daughter's first birthday I wanted to create a game that everyone could play- from age 1 to 68. I wracked my brain and finally came up with Baby Bingo. I created the cards on Publisher with my sweet husband's help (he drew the cute doggie!) For this to work, each card had to be different. This is a little tedious, but not difficult. We used pencils to cross off squares as they were called. I made a mat out of an old blanket using fabric paint and a sharpie (hubbie drew the doggie again!) 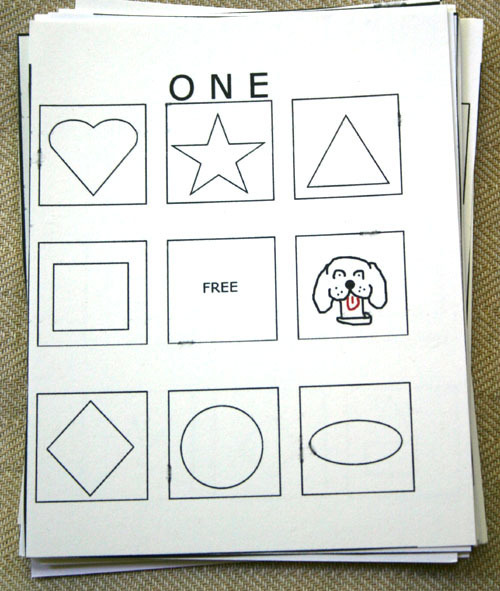 The center just has the word "ONE" written in it and surrounding it are squares containing the symbols on the cards. I put the birthday girl down in the middle and any square she sat in or the last one she crawled through before leaving the mat, was the symbol I called. As soon as someone made a row they called out "ONE!" I had separate prize buckets for kids and adults and we played several games. Everyone had fun and joined in.